How are quartz worktops made? 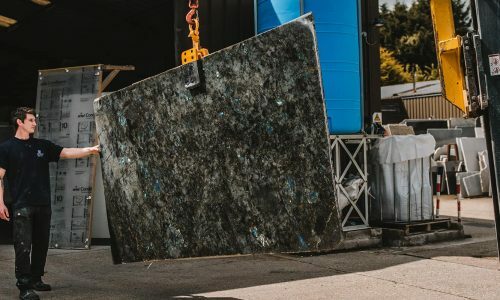 If you’re thinking of investing in a quartz worktop, you may well be wondering how they’re made. Quartz is a natural stone, but there are a few more steps between quarrying and installation than with stones like marble and granite. Below you’ll find an outline of the process our quartz worktops go through before they arrive in your home as part of your dream kitchen. The exact details of how slabs of quartz are created contains proprietary information that the manufacturers aren’t keen to share. Broadly speaking, manufacturers such as Quarella or Compaq select and blend quartz and other materials and minerals. These may be fine particles, larger chunks or a blend – each combination creates a different texture in the finished piece. The stone particles are bonded together using an adhesive polymer or resin. This bonding agent can contain pigment, which is why quartz worktops are available in such a wide range of colours: as well as natural stone shades, you’ll find quartz slabs in sunflower yellow, royal blue, phone box red and a host of other hues. Quartz slabs are manufactured to a particular size and thickness. While this varies from brand to brand, quartz worktops are typically available in 20mm and 30mm thickness. The quartz slabs are shipped to the UK from the manufacturing facilities. Once slabs arrive in the UK, they wait in a workshop or warehouse for the right customer to come along. Quartz is one of the toughest natural materials, and quartz worktops can be harder than granite so it requires special tools to transform a slab into a finished quartz worktop. All quartz and stone worktops have to be cut precisely to shape in a stone cutting workshop. At Surrey Marble and Granite, we cut and finish all the worktops we sell in our own Surrey-based factory. This means that we can offer a quick turn around, going from template to install in as little as 5 days, and can confidently deliver on our promises – you won’t have to worry that the showroom will offer one thing and you’ll wait 6 weeks to find out the supplier can’t do it. Every quarts worktop we make is made from a template created by our experts. Ideally, we will take detailed measurements of your actual, finished kitchen space before making the template. 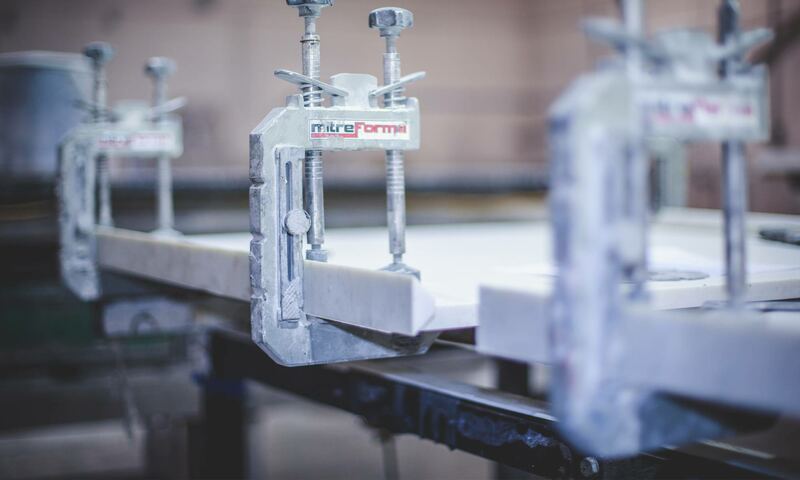 This is because quartz worktops, like marble and granite, need to be cut using special tools so the worktop needs to be finished with millimetre precision in order for it to fit properly and integrate with any sinks, taps, hobs or other intrusions. Unlike vinyl or wood, you can’t simply drill a new hole in stone yourself if you want to move a tap. Our team take great pride in their work, from templating to installation, and we are proud to be approaching a 100% satisfied customer rate.